Learning Graphic Design & Illustration helps students explore the different career paths available to them while learning key graphic design and illustration concepts, skills, and applications. 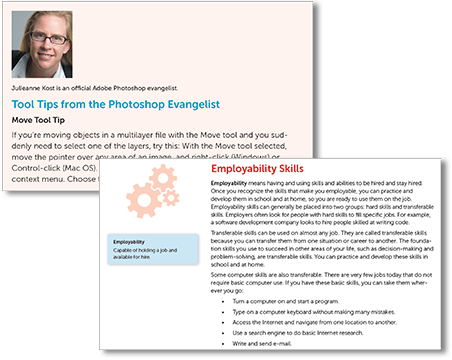 Students receive an in-depth introduction to Adobe Photoshop and Adobe Illustrator, two of the most widely used graphic design applications in the world. 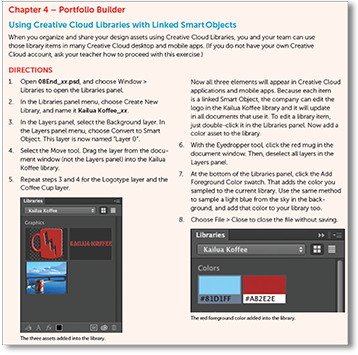 This book supports the Creative Cloud versions of these applications. Adobe Creative Cloud gives students access to the most up-to-date tools and features for all Adobe applications. Students will come away with a deeper understanding of the industry with a focus on fundamental elements and principles of visual art and design. Students will learn and practice design skills as they complete real-world projects such as preparing advertising and marketing materials, designing clothing, or readying files for various types of output. 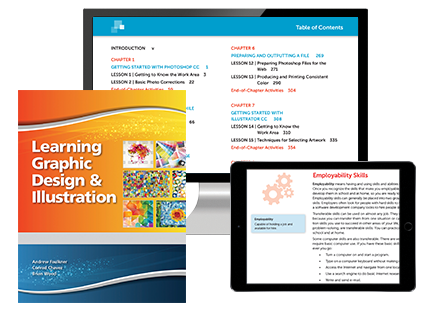 These features cover a variety of subjects related to the study of graphic design, preparation for a career in graphic design, and the skills and qualities needed to be a successful employee. Many of these features include review projects that allow students to explore the feature through further research, writing, and designing. Review questions, hand-on projects, a Critical Thinking project, and the Portfolio Builder help students apply all the skills they’ve learned in the chapter and in previous chapters.